Brick and mortar construction is still the benchmark for durability and beauty. The chemical reaction of cement, lime and aggregates create a cohesive structure which will stand the test of time and provide a beautiful and weatherproof finished product. All mortars, grouts, or concrete blends are not equal however. The issue begins in the initial blending of the products. Traditional masons used the old fashioned shovel and bucket method to “weigh” ingredients. Measuring ingredients utilizing the shovel has been used successfully for hundreds of years. In today’s market however this is in many cases not enough. With performance testing and the new ASTM standards, this form of measurement has become atypical to the modern mason. The problem with volumetric measuring is that it dramatically increases the possibility of an inconsistent final product. While Portland and Lime are easy to measure via the shovel method, aggregates are impacted by a phenomenon known as bulking. 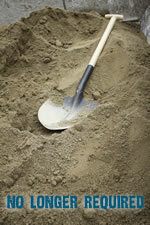 Pending the moisture content of the sand, the volume can vary up to 30%. This would result in a large variation in the composition and yield of the mortar itself. Add in the changing weather patterns we experience in the northeast and you can see where the sand pile you have in the morning may be totally different in the afternoon. Meaning a one shovel mix by volume may be one third short by weight. This fluctuation would not only impact the mortar’s strength and durability, but it will also have an impact on the finished product visually. PACKAGE PAVEMENT is here to help you avoid these issues by crafting a batch controlled quality assured and tested product every time. All of our raw materials are run through a dryer to ensure the moisture level is ideal for packaging. Utilizing a computerized batching and scale program we have tolerances of less than 1% for each ingredient, This means the final product will be consistent batch after batch for the duration of the job. Through this consistency you gain not only predictable product yields but also a product that is workable and easy to use.